Scientific knowledge regarding the effects of solid waste incineration facilities on the health of a population living nearby is constantly being updated. A practical issue, and one of significant policy importance, is that the majority of published epidemiological studies relate to these older plants. With the more recent European Union regulations  many older plants have closed, or been fitted with more stringent emission controls. While this is obviously desirable from a public health perspective, it does raise issues of the relevance of studies around older plants, to populations affected by more modern facilities. Proponents of new facilities tend to dismiss the older research as irrelevant. Opponents take a contrary view arguing, not unreasonably, that similar claims of safety were made in relation to those older facilities when they were operating; that the risk assessments relied upon to show new incinerators are safe would not, if applied to the older plants, reveal the levels of impacts reported in the literature thus indicating that the risk assessments do not validate in real-world situations; and that epidemiology, by it’s nature, involves retrospective studies. Furthermore the modern incinerators tend to be much larger than those operated historically so that although the emissions concentrations have reduced the total mass of pollutant emissions may even increase. The comprehensive review by the Health Research Board , commissioned by Department of Environment and Local Government, was obviously aware of these arguments and concluded that “there is some evidence that incinerator emissions may be associated with respiratory morbidity” and that “acute and chronic respiratory symptoms are associated with incinerator emissions”. The review also confirmed that “a number of well-designed studies have reported associations between developing certain cancers and living close to incinerator sites. Specific cancers identified include primary liver cancer, laryngeal cancer, soft-tissue sarcoma and lung cancer”. The Health Research Board recognised the problems of isolating causation in real world epidemiology and commented that “it is hard to separate the influences of other sources of pollutants, and other causes of cancer and, as a result, the evidence for a link between cancer and proximity to an incinerator is not conclusive”. They suggested that this could be addressed by “further research, using reliable estimates of exposure, over long periods of time, is required to determine whether living near landfill sites or incinerators increases the risk of developing cancer. Studies of specific environmental agents and specific cancers may prove more definitive in the future”. 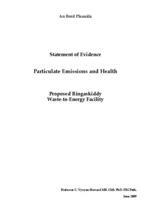 In that context this evidence reviews the possible health impacts associated with emissions from incinerators and a specifically the concerns associated with ultrafine particulates. The relationship between air pollution and mortality has been well known for many years. Two of the most notable pollution incidents confirming the effects of air pollution were firstly the tragic events of the Meuse Valley, Belgium, where in December 1930, in the small town of Engis 60 people died in the space of three days . This disaster provided incontrovertible evidence that air pollution could kill and therefore it attracted considerable attention from the scientific community. In a contemporary editorial in the British Medical Journal, Haldane  stated that “the possibility of a similar disaster happening in this country [the UK] is a matter of great public health interest”. He thought that disaster had been avoided so far in London because the city emitted a lot of heat, which produced convection currents. He warned – though to no avail, against plans to build big electricity generating stations. The subsequent London pollution incident in December 1952 resulted in an increase in deaths that has been estimated to be of approximately 4,000 by Logan (1953) or 12,000 in a more recent retrospective study . Despite these huge impacts, it has not been until the last decade did the scientific community focus in earnest on the potential health hazard of PM exposure . Epidemiological studies worldwide have consistently demonstrated links between ambient particulate matter exposure and adverse health outcomes, including increased rates of respiratory and cardiovascular illness, hospitalizations, and pre-mature mortality [9, 10]. Particles are usually defined by their size, e.g., PM10 and PM2.5, as the mass of particles with aerodynamic diameters less than 10 to 2.5 μm, respectively. Recently, however, interest has also focused on the fraction of ultrafine particles (UFP) with a diameter less than 0.1 μm, which are abundant in number but contribute little to the mass [11, 12]. The UFPs are only usually measured for research purposes and are effectively outside regulatory control. It is these emissions that are the main theme of this evidence. Studies have shown that ultrafine particles are more toxic than larger particles [13-15]. Furthermore, individual particles have been shown to be capable of inducing inflammation and oxidative stress , suggesting that particle number concentrations, which are dominated by ultrafine particles, may be more indicative of some potential health impacts than particle mass concentrations. UFP are also important because of their high alveolar deposition fraction, large surface area, ability to induce inflammation, and potential to translocate into the blood circulation system. At a given mass, ultrafine particles (diameter < 0.1 μm) have 102 to 103 times more surface area than particles with diameters in the 0.1– 2.5 μm range and approximately 105 times more surface area than coarse particles (2.5 μm < diameter < 10 μm) . This surface area-to-mass effect may affect the relative toxicity of particles to respiratory systems, in combination with a higher deposition efficiency of ultra fines in the alveolar region (Hughes et al., 1998). Estimates of the number of excess deaths on a global scale due to particle inhalation have been made, and they amount to about 2 million/year of which c.370,000 per year are within the EU. The health effects are not limited to lung injuries. They deaths also include cardiovascular diseases and cancers . It is interesting in the light of these impacts to consider that as recently as 1992 the Lancet editorial was claiming that “environmental pollution is unlikely to result in gross excess mortality” . Although not such a high contributor to national PM inventories incinerators appear to be very important local sources of particulate contamination. Aboh  assessed the contribution of a modern incinerator in Sweden to local PM2.5 levels and concluded that between 17 % and 32% of the particulates arose from the incinerator. This contribution may seem to be large compared with the relatively small increased modelled by Indaver of 0.5 μg/m3 compared with an assessed background level of c 7 μg/m3. Indaver appears to ignore, however, the very significant contribution made to particulate burdens by SOx and, especially, NOx emissions. There remains significant uncertainty about the level of health impacts associated with ultrafine particulates and other emissions from incinerators. The WHO  emphasises that “priority needs for research include development and application of biomonitoring, both in human observational studies and in toxicological research, the use of pharmacokinetic models to assess the influence of factors such as metabolism and timing of exposures, and the analysis of all relevant environmental matrices, in order to evaluate chemical exposure pathways and to assess the exposure for specific subsets of the population”. I consider that the evidence of risk of harm to human health and the environment is sufficiently high that a precautionary approach should be taken towards the permitting of new incineration capacity at least until there is much better information from the biomarker studies recommended by the WHO  and the Health Research Board . Professor C. Vyvyan Howard MB. ChB. PhD. FRCPath. Vyvyan Howard is a medically qualified toxico-pathologist specialising in the problems associated with the action of toxic substances on the fetus and the infant. He is Professor of Bioimaging at the University of Ulster and has written a number of papers and book chapters and spoken in a variety of forums to draw attention to the threat posed by environmental pollutants to the developing fetus. He is a Fellow of the Royal College of Pathologists, Past President of the Royal Microscopical Society, Member of the British Society of Toxico-Pathologists, Immediate Past President of the International Society of Doctors for the Environment and Member of the European Teratology Society. He has just completed 6 years as a toxicologist on the UK Government DEFRA Advisory Committee on Pesticides. A large part of Professor Howard’s current research is the investigation of the fate toxicology of nanoparticles. His research team is in receipt of two large EU grants; ‘NanoInteract and ‘NeuroNano’. He has co-edited a book entitled ‘Particulate Matter: Properties and Effects upon Health’ published in September 1999 . Vyvyan Howard has sat on two EU expert groups considering the threats and benefits posed by nanotechnology and recently addressed the House of Lords Select Committee on Science and Technology investigating the use of nanotechnology in food.